This is the first in a series of newsletters that should help explain my tree planting information in more detail than ever before. 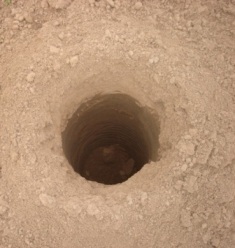 The first step is to dig the hole the correct size and shape. Before even starting to dig the hole, the actual height of the root ball needs to be established. 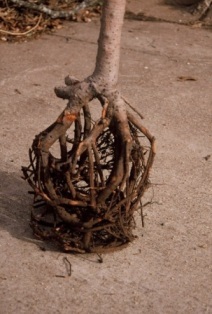 Most trees, in containers and balled and burlapped, have excess soil on the top of the true root ball. The excess soil needs to be removed. Now you can measure the width and the depth of the actual root ball. 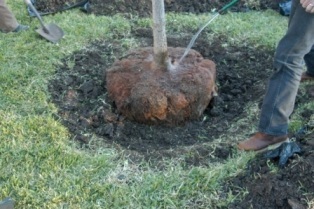 Dig a very wide, rough-sided hole, 2 to 3 times wider than the tree ball, especially at the soil surface. Square-shaped holes also work. The point is to have well aerated soil around the new root ball and to prevent the roots from circling in the hole. Digging a small, smooth-sided hole is the worst thing you can do. The width of the bottom of the hole isn’t as important as the top of the hole. The depth of the hole should be slightly less than the height of the ball. Measure – don’t guess. 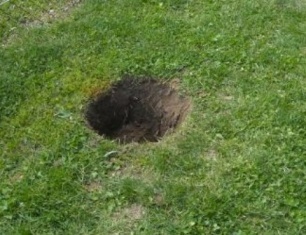 The worst way to dig a tree hole - small and round. Holes dug with augers are worse than those dug with shovels. The top of the root ball should be sticking out of the ground about 2” after planting. The bottom of the root ball should be sitting on firm undisturbed soil. When you over-dig and have to put backfill under the ball, the tree can settle. THIS IS A COMMON CAUSE OF ROOT FLARES BEING TOO DEEP IN THE GROUND. If fill under the ball is unavoidable, tamp the soil to compact it before planting. If you set the ball too low in the first place, that can be even worse. It’s best to set trees and other woody plants 2-3” higher than ground grade (even higher with larger root balls) to allow for settling and/or being planted too low. One of the results of planting in a small, smooth-sided hole. If you have any questions on this newsletter or any other topic, tune in Sunday 8am -11am (CST) to the Dirt Doctor Radio Show.